Steinway & Sons has been making pianos for since 1853. Each piano is hand-built using a process that takes almost a full year to produce an instrument. The company maintains a showroom and concert venue in New York City, and famous pianists from all over the world have been “Steinway artists”–committed to playing only on Steinway pianos. This article will teach you how to identify a Steinway piano. 1. Look above the keyboard of the piano for a maker’s name. If the name is “Steinway,” “Boston” or “Essex,” then the piano is a Steinway-made piano. 2. Look on the back top corners of upright pianos or inside a grand piano for a serial number. The serial number on a grand piano may appear in several places: in front of the tuning pins; on the sound board; on the metal plate near the hitch pins or plate ribs; near the treble or bass bridges; and near the capo d’astro bar, just behind the hammers on the treble side. Steinway serial numbers begin at 1,000 in 1853 and increase at irregular intervals for each year thereafter. You can check your piano’s serial number against the list of Steinway numbers found on the Steinway site in Resources below. If you have trouble finding the serial number, ask your piano technician or tuner for help. 3. Check for patent numbers on the metal frame of the piano. Steinway holds the following patent numbers, so if you see one of these, that part of the piano—if not all of it—was made by Steinway: 17,238; 20,595; 26,300; 26,532; 32,386; 32,387; Re. 1,271; 34,910; 55,385; 81,306; 88,749; 93,647; 97,982; 115,782; 126,848; 127,383; 127,384; 135,857; 156,388. 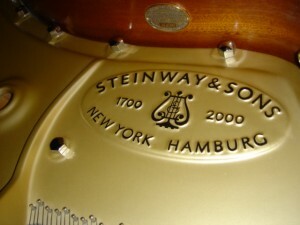 If the piano does not bear any of these marks—maker name, Steinway serial number or patent number—it isn’t a Steinway.